The credentials of judges on the Supreme Judicial Council (SJC) to hear presidential reference against ‘non-functional’ Chief Justice Iftikhar Mohammad Chaudhry would be the first item to figure in his defence when the proceedings in the case start on Tuesday. 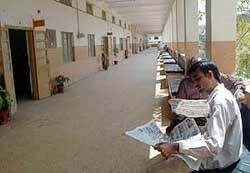 A man reads a newspaper at a Karachi court after lawyers boycotted the court on Monday. Chief Justice Iftikhar Mohammad Chaudhry has demanded that the Supreme Judicial Council (SJC) should hold open proceedings on the reference against him sent by President Pervez Musharraf. Pakistan Muslim League leader Chaudhry Shujaat Hussain has refused to comment on the presidential reference against Chief Justice Iftikhar Mohammad Chaudhry, saying that it is an internal matter between the Army and the Judiciary. Nepalese Prime Minister Girija Prasad Koirala, on Monday said that the recent activities of King Gyanendra, have paved the way for republican set-up in the country. An Indian couple is facing trial in a court here after their housemaid accused them of cheating her out of a prize won in a lucky draw. An untitled self-portrait by celebrated Indian artist Maqbool Fida Hussain fetched the highest price at the Gulf Art Fair here while the highest priced piece of art did not sell. Israeli Prime Minister and Palestinian President hold talks. The credentials of judges on the Supreme Judicial Council (SJC) to hear presidential reference against ‘non-functional’ Chief Justice Iftikhar Mohammad Chaudhry would be the first item to figure in his defence when the proceedings in the case start on Tuesday, Supreme Court Bar Association president, Munir Malik said Monday. According to media reports and SC sources, three members on the five-member highest judicial panel in the country face references pending against them on charges ranging from misconduct, misuse of authority, corruption and embezzlement. The fourth has a personal grouse against Justice Iftikhar for having occupied his residence in Karachi while the presiding judge has a conflict of interest problem. If Justice Iftikhar is absolved and reinstated he will continue to head the apex up to 2013. By then, acting Chief Justice would have retired without being elevated to the top office. Munir Malik addressed a rally of lawyers today outside the Supreme Court building here amid countrywide boycott of courts and demonstrations by members of the legal community. He deplored the action against Justice Iftikhar by President Gen Musharraf as “illegal, unconstitutional and malafide” and called for withdrawal of the reference. Lawyers chanted slogans against Musharraf accusing of launch a deadly assault on the independence of judiciary. The government has kept the chargesheet against Iftikhar in wraps. It would be known on Tuesday when the hearing begins. There are indications that the proceedings would be held in camera. But Justice Iftikhar told Air Marshal Asghar Khan that he wanted an open court. The revered veteran politician forced his way into the heavily guarded residence of the deposed Chief Justice on Sunday evening. Justice Iftikhar told him that his telephones, including cell phones, have been disabled, TV cable disconnected and that he was denied access to newspapers. He has not been allowed to contact any counsel to defend him. The national flag on his residence has been pulled down while his profile on the website of the Supreme Court has been deleted. Government ministers insisted the Chief Justice had not been detained but offered no explanation for cutting him off from the outside world. Daily News on Monday reported that two of the three judges on the reference panel are already faced with references pending before the SJC. A third judge is said to have had his two daughters admitted to a medical college on the basis of special seats offered by a Chief Minister. A son-in-law of the same judge was also appointed deputy secretary in the provincial secretariat of the same province on deputation. The pending references against the two judges, who along with three other members of the Supreme Judicial Council will decide the fate of the recently rendered “inactive” Chief Justice of Pakistan, pertains to alleged corruption and embezzlement. One of these two judges is facing allegations of involvement in a land corruption case while the other is accused of being involved in financial embezzlement. The SJC that has summoned the Chief Justice of Pakistan on March 13 comprises acting Chief Justice, Justice Javed Iqbal, who is the chairman of the SJC, the two most senior judges of the Supreme Court and two most senior chief justices of the high courts. Babar Sattar, an Islamabad-based lawyer, in a newspaper article has pointed out that the inclusion of Justice Javed Iqbal in the Supreme Judicial Council creates a conflict of interest. Meanwhile, a source pointed out that SHC Chief Justice Sabihuddin Ahmed should also not sit in the SJC for the reason that the much-condemned open letter of a supreme court lawyer also included an allegation against the chief justice regarding the use of the official residence of the Sindh CJ by Justice Iftikhar. Meanwhile, according to a report published in an English daily, ahead of the presidential reference against the Chief Justice, there are already 23 references/complaints pending hearing with the Supreme Judicial Council against several judges. This was stated by Air Marshal Asghar Khan (retd) after a meeting with Justice Chaudhry here on Sunday. The demand made by the suspended chief justice indicates that he is not ready to resign and is determined to contest the allegations levelled against him. Asghar Khan is the first private citizen to be allowed by the government to meet the suspended chief justice since he was confined to his official residence after having been declared ‘non-functional’ on Friday. Justice Chaudhry, according to Mr Khan, rejected the allegations as baseless and said he had not done anything wrong. He stressed the need for an ‘open trial’ so that he got a fair opportunity to defend himself. Taking to Dawn, Air Marshal Khan quoted the CJ as saying that he had been held incommunicado and was not allowed to see his lawyers and friends. He said he was not being provided newspapers and his TV cable and telephones had been disconnected. Air Marshal Khan said security personnel asked his name when he reached the residence of the chief justice and he managed to enter the house while they were seeking instructions. He said he had met the chief justice as a citizen of Pakistan. He said the action against the chief justice was inappropriate and he should get an opportunity to defend himself. Asked if he had been told by Justice Chaudhry about pressures on him to resign, he said they had not discussed the matter. Though the retired Air Marshal got a chance to meet the ‘non-functional’ chief justice, a delegation of the Pakistan Muslim League (Nawaz) led by its acting parliamentary leader in the National Assembly Chaudhry Nisar Ali Khan was denied the opportunity. Observers see the meeting of Mr Khan with Justice Chaudhry as a tactical move by the government to create an impression that there are no restrictions on the non-functional chief justice. The government claims that Justice Chaudhry is neither under detention nor under house arrest. “There are no restrictions on him,” minister of state for information senator Tariq Azim told Dawn. He said the opposition was trying to politicise the matter, which was regrettable. About the chief justice’s demand for open proceedings on the reference, he said it was entirely up to the Supreme Judicial Council to decide how it wanted to conduct the proceedings. “We expect that he will be given an opportunity to defend himself,” he remarked. Senator Azim said the court was completely independent and the public had full confidence in its professionalism. Interior Minister Aftab Ahmed Khan Sherpao also denied reports that the non-functional chief justice was under house arrest and said anybody who wanted to see him could do it. Talking to newsmen here, the minister termed the threats to lay siege to the Supreme Judicial Council illegal and said nobody would be allowed to take the law into his hands. Meanwhile, the Supreme Court Bar Association (SCBA) and the Pakistan Bar Council (PBC) have decided to file a joint application to the Supreme Judicial Council seeking permission to be heard during the proceedings. “I believe whatever steps we take should be in line with the law and the Constitution.” Replying to a question about the upcoming elections, the PML chief said the polls would be held on schedule, however, these could be postponed in case Iran was attacked. He said Musharraf’s re-election would take place from the existing assemblies. He ruled out any possibility of meeting PPP chairperson Benazir Bhutto, who flew to New York a few hours before his arrival. Ms Bhutto is scheduled to address a PPP-organised Pakistan Day function in Brooklyn, a borough of New York City, on March 18. Our Correspondent adds: Former prime minister Benazir Bhutto has said that the suspension of the chief justice at a time when crucial constitutional issues are to come up for decision appears to be an attempt to influence the judiciary. Premier Koirala, who has been facing charges of trying to protect monarchy by offering some space for the king as well, said that the king himself had cleared the way for republican set-up by giving controversial statement on February 19 on the occasion of Democracy Day. Talking to journalists at his hometown Biratnagar in eastern Nepal this morning, Koirala said, "The king misinterpreted my call for allowing the space for all and issued a controversial statement that activated regressive elements to destabilise nation." On February 19, King Gayanendra, had issued a statement and tried to justify his February 1, 2005, Army coup and usurped executive power saying that he had taken that move as per the desire of the people after the political parties failed to run the country. Later on February 21, the Interim Legislature had passed a resolution denouncing the king's statement and issued a directive to the government to take action against him immediately. Octogenarian Nepali Congress President Koirala, said, "If the king and crown prince are willing to give up their throne by their own volition a new environment can still be created." However, Koirala, did not explain what he meant to say with "new environment". When asked about the possibility of declaring republic set-up directly through the Interim Legislature as the king himself had cleared the way to this end, Koirala, replied that the position of the king would be decided only after the Constituent Assembly election in June. In November 2006, while reaching Comprehensive Peace Agreement the seven-party alliance and Maoist had agreed to decide the fate of the king by the first meeting of the Constituent Assembly. The couple won a car by putting their housemaid's name on a raffle ticket. Dubai public prosecution charged the Indian couple with breach of trust for taking the Lexus car worth Rs 4,762,874 after a ticket with the Indian housemaid's name came out as the winner in a draw during the 2004 Dubai Shopping Festival. Damien Hirst's Spot Mini, a car owned by the Saatchi Collection and insured for $2 million, did not sell while Husain’s self-portrait topped the list with $130,000. This was the first international art fair in West Asia and attracted galleries, including London's Albion, New York’s Max Lang and Seoul’s Gallery Hyundai. The idea was to tap into some of the $500 billion of oil revenue the Gulf earned last year.